An exhibition on the heritage and history of Lough Erne was launched in Fermanagh County Museum on Saturday 14th April by the Vice Chairman of Fermanagh and Omagh District Council, Councillor Alex Baird. Lough Erne since ancient times was a major transport hub, used by farmers, pilgrims, travellers, armies, those living on the islands and on the shore. The path of the Erne covers Counties Longford, Cavan, Fermanagh and Donegal. The exhibition was curated in conjunction with the Lough Erne Heritage Society, first established three years ago and whose aims are to ensure that the unique and fascinating history of Lough Erne and the surrounding areas is not forgotten. 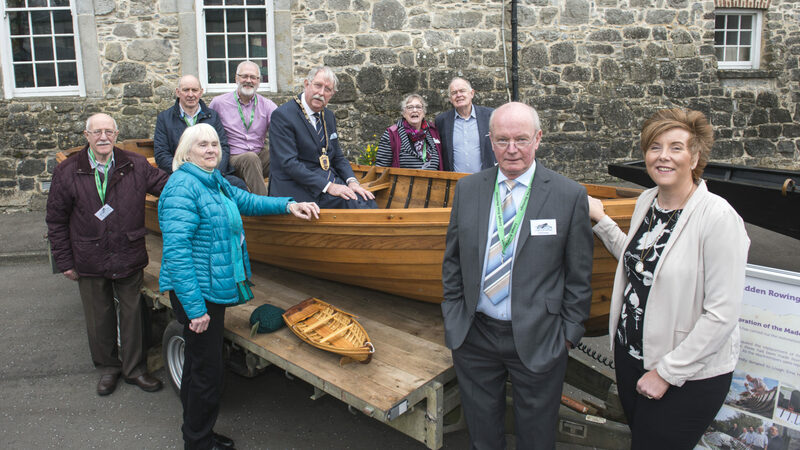 The Lough Erne Heritage Society encourages research about Lough Erne, its traditional boats and the people who built and used them. A key role of Lough Erne Heritage is to ensure that the Erne’s unique and fascinating artefacts, history, traditions and records of the people connected with its waterway are preserved and celebrated. This exhibition is a taster of some of the work so far of Lough Erne Heritage. Speaking at the official opening of the exhibition, the Vice Chairman of Fermanagh and Omagh District Council, Councillor Alex Baird said “I recognise the importance of ensuring that the Erne’s unique and fascinating history, artefacts and the traditions of the people connected to the waterway, are preserved for future generations to enjoy. Exhibitions such as this are an excellent way of commemorating our rich heritage on the river. Guest speaker, Mr. Michael Goodwin travelled from Dublin for the official launch on Saturday. He reminisced about family life on the lough. His ancestors came from near Crom on Upper Lough Erne where he travelled as a schoolboy for his holiday excursions. His family had a very unique history in its involvement with racing yachts at Crom on Upper Lough Erne and participation in the Lower Lough Regattas. Yachts were built, were maintained and sailed by members of local families and his family’s ancestors were very heavily involved in this for a number of generations. Fred Ternan, Chairman of Lough Erne Heritage commented: ‘With the many visitors from all over the world visiting the museum, Lough Erne and its unique history will become much more well known. We continue to hear and research fascinating stories about the lough. People will become aware of the exhibition and may come forward with interesting stories of their families involvement in particular aspects or strands of Lough Erne`s Heritage’. Information on this year`s programme of events planned by the Lough Erne Heritage group is included and available with the exhibition. The exhibition continues until 24 June 2018. The exhibition is open to the public during normal museum opening hours and the usual Museum admission rates apply.